This light and fresh deli-style salad that I originally bought from Stater Bro. Market in Joshua Tree sustained me for a couple days whether before a hike in Joshua Tree National Park or as a light snack on one of our many car rides during our southern California summer vacation. I know this salad will become a permanent addition to your summer rotation of favorite, go-to recipes. Bring the quinoa and 1 3/4 cups of water to a boil in a medium saucepan. Cover with lid and reduce heat to medium-low. Cook for 10-12 minutes until water is absorbed and quinoa is tender and fluffy. Set aside to cool slightly. Place the quinoa in a large serving bowl. Add in the edamame and the remaining ingredients (through ground black pepper). Toss well to combine. Taste and adjust for seasoning. Serve immediately or cool in refrigerator and serve cold. I like to prep all the veggies while the quinoa cooks. If you'd like to add in some animal protein or seafood try grilled chicken, beef steak or shrimp. For the vegans it is perfect the way it is. I like the simplicity of the salad but you could dice up some feta cheese for a tangy twist or some mozzarella for a milder cheesy addition. 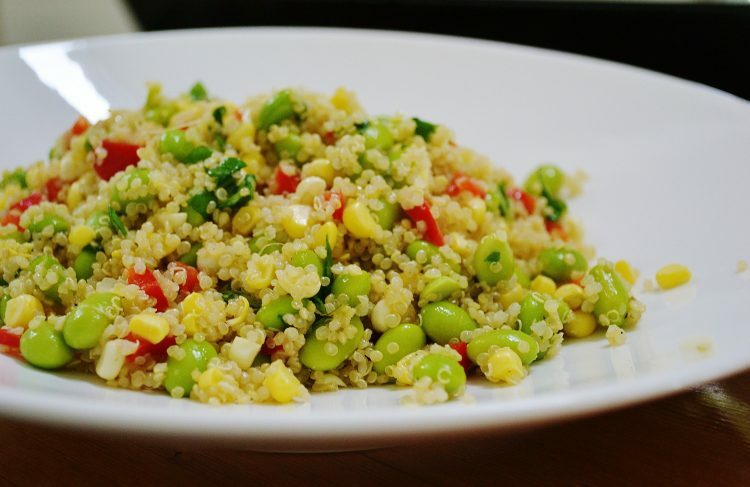 Quinoa is a seed that cooks like a grain so it's great for those that are gluten free or on a paleo/primal diet.